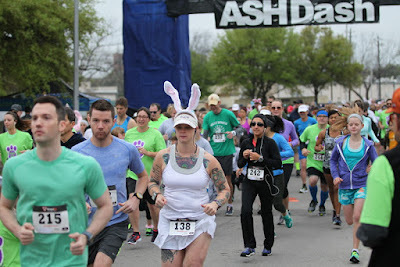 This year was the second year for me running the ASH Dash Bunny Run 5k. 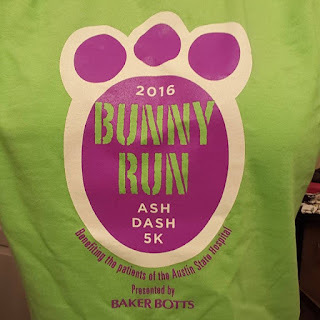 This race is put on by the Volunteer Services Council at the Austin State Hospital. The race is a fundraising event for the Council and all proceeds will assist them in continuing to provide important programs and services to supplement treatment at the Austin State Hospital. And yes, the Austin State Hospital provides services to mental health and developmentally disabled patients. As a lot of you know, I have a lifelong battle with my own mental illnesses of a dysthymic disorder that causes chronic major depression that may or may not get triggered by an actual life event (sometimes it just happens and that makes it so much harder to deal with), general anxiety disorder, OCD, and an eating disorder. I have also had moments in my life where I thought of the most drastic actions as a potential solution to the pain I endure. Thankfully, caring doctors noticed the direction I was heading and helped me out of that deep, dark pit of hopelessness. Anything that I can do to help others with their own struggles and to help them find their own way out of the darkness, I will do what I can to help. Running this race is one of the small things that is within my power and financial ability to do to help. Last year, a LOT of super fast people ran this race and I came in 7th in my age group with a time of 28:24. 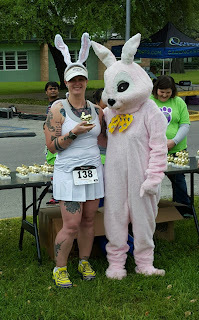 It was super windy last year and I know I compromised my running economy because I was using one hand to hold my bunny ears on almost the entire run. If you’re interesting you can read about last year’s race here. They had packet pickup the day before the race from 3-7pm. Well, I work from 2-10pm and my lunch break isn’t long enough for me to make the drive to fetch my packet, even though the ASH campus is fairly close to where I work. Thankfully, they offered race morning packet pickup! I seem to be doing a lot of race day packet pickup this year. I’m just glad enough of these races are offering it. I do wish more races did, but I completely understand why larger races don’t offer it. It would be ridiculous. I got my packet super fast and super easy. The race shirt this year is an Easter lime green with a purple bunny paw print on the front. I ran into my running friend, Rob, on my way back to my car and we chatted for a bit. I sat in my car and ate my bagel and drank my coffee. I slathered the Body Glide on my inner thighs since I was wearing a running skirt. I put my ears on my head and then strapped them down real good with my visor. Thankfully, this year, it wasn’t windy at all! And the temperature was perfect as well, since I wanted to wear a tank top for this race. I was also trying out a new running belt that is the same brand as the one I reviewed a few weeks ago (the SLS3 double pocket waterproof belt). This one is a single pocket with 2 compartments, one for your phone that has a clear plastic cover to it so you can use your touchscreen phone without taking it out! Let’s just say I loved it! Anyway, I also pinned on my floral ball for a bunny tail. Then I walked back to race start area. Then I saw my friend Ben walking toward the start area with his wife and daughter (this was his wife’s first 5k! Last year she just spectated. She didn’t run it, but walked it with their daughter in her stroller, but still, it was her first 5k so hooray!). Then it was time to head to the start line and Rob popped up again. They’re both pretty fast so we were at the very front and I was thinking that I shouldn’t be that far in the front and kept saying I hoped no one literally ran me over when they started us. The course is 2 loops around the hospital campus. As we set out for our first lap, I was trying to go fast yet not too fast. I wanted to find a groove and settle in. You know, that slightly uncomfortably hard place. Breathing is labored but not gasping. The first mile chimed and I had run it in 8:26. I was trying desperately to remember what my current PR finish time was (it was either 27:08 or 27:14) and was also trying to remember what my mile splits were. I figured 8:26 was right on target for a new PR for me, so I just tried to hold that pace. However, it was a little too fast because my pace slipped a little on the second mile. I finished the second mile in 8:53. Dang it. 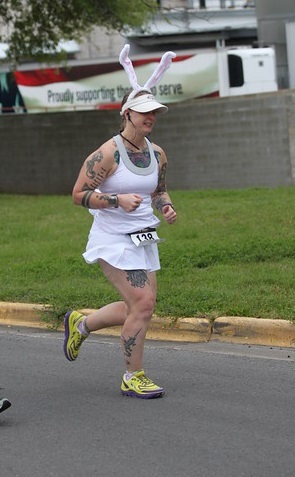 I was thinking that wasn’t going to get me a new PR, so I tried to really push it in the third mile but was failing. For the majority of mile 3 I was actually over a 9:00 pace. At 2.9, I really kicked it and managed to squeak that mile in at 8:58. I did the final .1 mile at a 7:57 pace. My final Garmin time was 27:12. As we waited for them to start posting the results on the table, I uploaded my Garmin data to my phone (hooray for the ANT+ app I downloaded a while back!) and discovered that my previous PR was 27:14 so I had PR’ed by 2 seconds! WOOHOO!!! They finally started posting the official race results so Rob, Ben and I wandered over and stood in line. I found my name and saw that my official chip time was 27:09 (so I PR’ed by 5 seconds…even better!) and then was completely shocked to see a “1” next to my age group designation of 35-39. I asked if I what I was seeing was that I took first in my age group and like 3 people responded that that was exactly what I was seeing! OMG OMG OMG OMG! 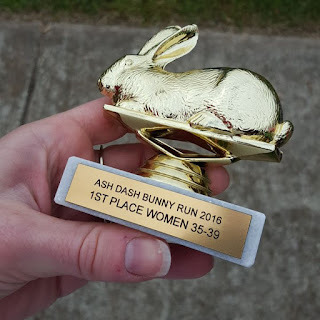 Last year all the women in my age group were so FAST! 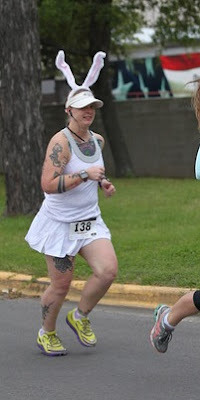 This year, every time a woman passed me, I looked her up and down and tried to determine if she was in my age group or not. Apparently NONE of them were in my age group! WOOHOO!!!! They wait until the final race participants cross the finish line before handing out the awards. Most races that hand out age group awards issue medals. 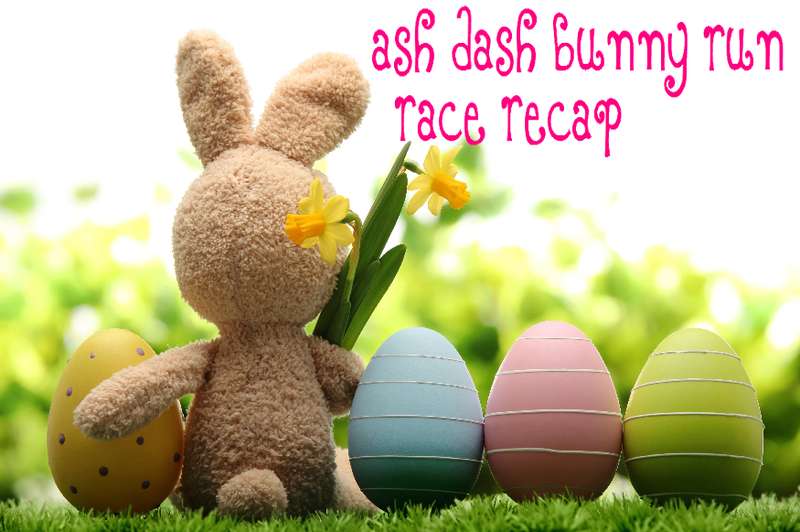 The ASH Dash does it a little differently and hands out TROPHIES!!! 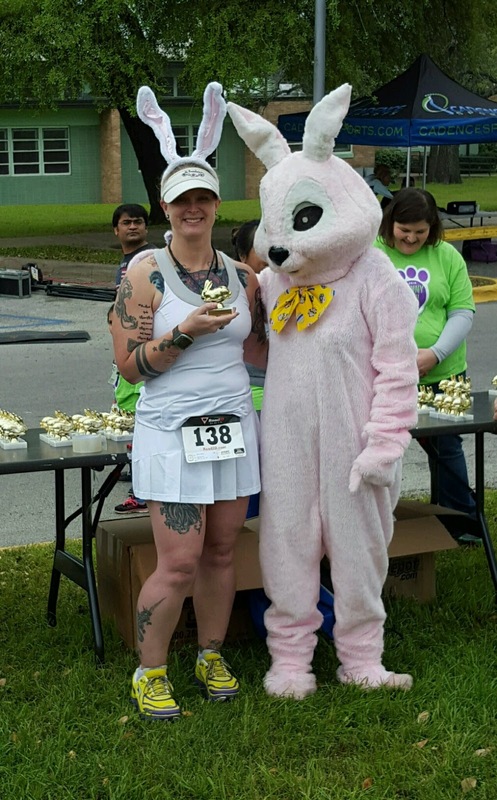 So, I am now the proud owner of a golden bunny!!! I’m so beyond happy that I was able to not only get a new PR but I won first place in my age group!!! Also, even though I said I felt like I was pushing as hard as I could while I was running that last mile, when I finished, I recovered quickly and I’m pretty sure I can push myself more and that sub-27 minute 5k is in my future this year!